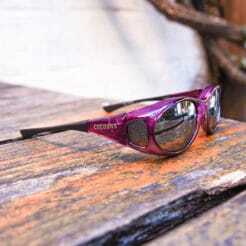 Measure the full WIDTH of your glasses at the widest points, and the HEIGHT of your glasses from top to bottom. 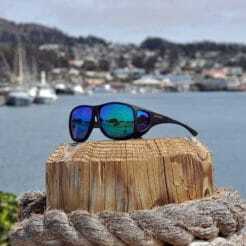 Our Polarized Mirror Fitovers are designed for the harshest, brightest outdoor conditions where intense reflected surface glare can greatly inhibit visual performance. Cocoons scratch-resistant Polare gray and amber lens systems are enhanced with high performance mirror coats developed to maximize the polarization efficiency of the lens system. The micro-thin metallic layer enhances the glare cutting properties of the base lens by creating an additional reflective barrier designed to combat even the most intense glare from surfaces such as water and snow. 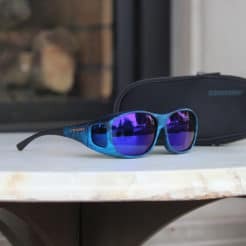 The patented OveRx designs utilize scratch-resistant Polare 100% polarized lens systems to deliver unparalleled protection from damaging UV light and cut through blinding glare. Each frame design incorporates integrated brow and underside protection to eliminate reflected light from above and below, while the injected polycarbonate side shields block peripheral light without compromising the wearer's range of vision. Cocoons feature the patented Flex2Fit adjustable temple system engineered to deliver a custom fit that is extremely comfortable and secure. All Cocoons fitovers include a custom neoprene case, large lens cloth, and limited lifetime warranty.